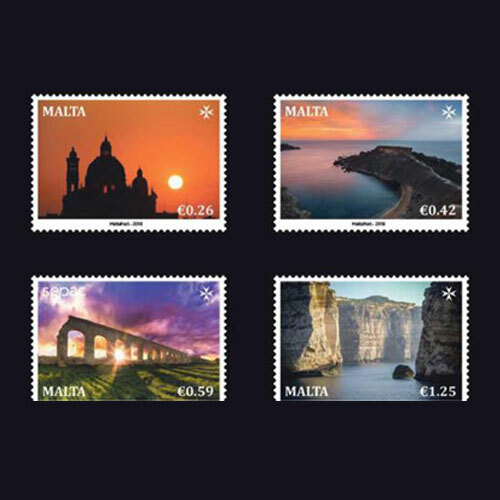 MaltaPost became a part of a philatelic stamp issue by SEPAC (Small European Postal Administration Cooperation) themed 'Spectacular Views' on 27th July. Members of the organisation will showcase views of landscapes from their respective countries. A competition was held last year by MaltaPost to select four pictures from their country. The 20th Century Roman Catholic Church of Saint John the Baptist or Xewkija Rotunda in Gozo is depicted on the €0.26 stamp. It is the world’s third highest unsupported dome. G?ajn Tuffiena Bay near Manikata village is featured on the €0.42 stamp. Gozo Aqueduct or 'tal-?ammimiet', built during the British Rule between 1839 and 1843 is featured on the €0.59 stamp. The 2-km long aqueduct supplied fresh water from G?ar Ilma to Victoria. Dwejra Bay, well-known for its beautiful coastal formation and a shallow inland sea is featured on the €1.25 stamp. The stamps were issued in sheets of 10 stamps and each stamp depicts the Maltese Cross watermark.